It’s the fresh garden tomatoes that make this Tomato, Egg, and Olive Salad with Gorgonzola Vinaigrette such a winner for me; for a Paleo or Whole 30 version just use a vinaigrette dressing without cheese. This tasty salad is also low-carb, Keto, low-glycemic, gluten-free, and South Beach Diet friendly. Check the Diet-Type Index if you’re looking for recipes for a certain type of diet. Click here to PIN Tomato, Egg, and Olive Salad with Gorgonzola Vinaigrette! Sometimes the simplest combination of ingredients can result in a dish where the result is completely a wow. I shared this Tomato, Egg, and Olive Salad with Gorgonzola Vinaigrette with my nephew Jake, and we both completely loved this combination of delicious summer flavors.The salad is simply fresh, vine-ripened tomatoes, sliced and layered with slices of boiled egg and olives, then drizzled with a vinaigrette that had bits of gorgonzola cheese. What could be simpler or more delicious? And when summer tomatoes are at the peak of ripeness, this is the perfect thing to eat on a hot summer day. This gorgeous and delicious tomato salad is my Meatless Monday menu suggestion for this week. The recipe is low-carb, gluten-free, vegetarian, and can even be Paleo or Whole 30 approved if you switch out the gorgonzola vinaigrette for a dressing without cheese. Arrange perfectly ripe sliced tomatoes on a serving platter and top with slices of Perfect Hard-Boiled Eggs. Drain a can of olives and sprinkle over the salad. Whisk together olive oil, balsamic vinegar, and crumbled Gorgonzola to make the dressing and drizzle over the salad. Enjoy! Don’t forget a little sea salt and some fresh-ground black pepper for the perfect finishing touch. Fresh garden tomatoes make this Tomato, Egg, and Olive Salad with Gorgonzola Vinaigrette such a winner! Drain olive into a colander placed into the sink. Slice tomatoes in 1/2 inch slices, and arrange on serving plate (with cut side up on ends of tomatoes). 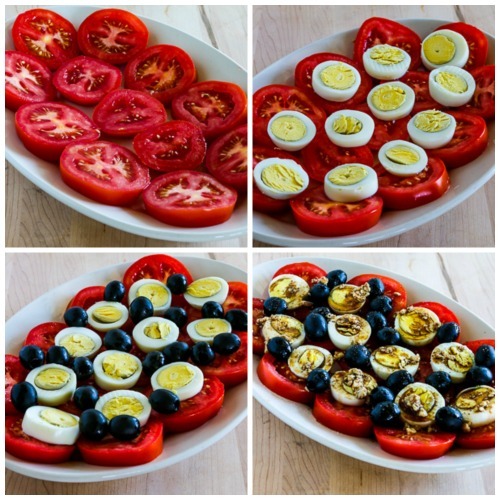 Slice boiled eggs and layer on top of tomatoes. Arrange drained olives on top of tomatoes and eggs. Put olive oil in small dish. Whisk in balsamic vinegar, then stir in gorgonzola. Drizzle dressing over salad, season with salt and pepper and serve immediately. You may not need all the dressing, depending on how you prefer your salad. This dressing will keep in the fridge for a few days, so you may want to double or triple the dressing amounts. You will need to let it come to room temperature and shake the bottle before serving if it’s been refrigerated. Here’s How to Make Perfect Hard-Boiled Eggs. I used Rosemary Salt for this salad. This Tomato, Egg, and Olive Salad with Gorgonzola Vinaigrette would make a perfect summer lunch for the South Beach Diet, any phase, and would also be great for most other low-carb eating plans. Love the flavor combos and the protein the eggs bring in. Just got some farm eggs and will be making this salad with the yellow taxi tomatoes in my fridge! Thanks Kalyn! Thanks Letty; hope you enjoy! such a simple salad, but full of so many of my favorite things! 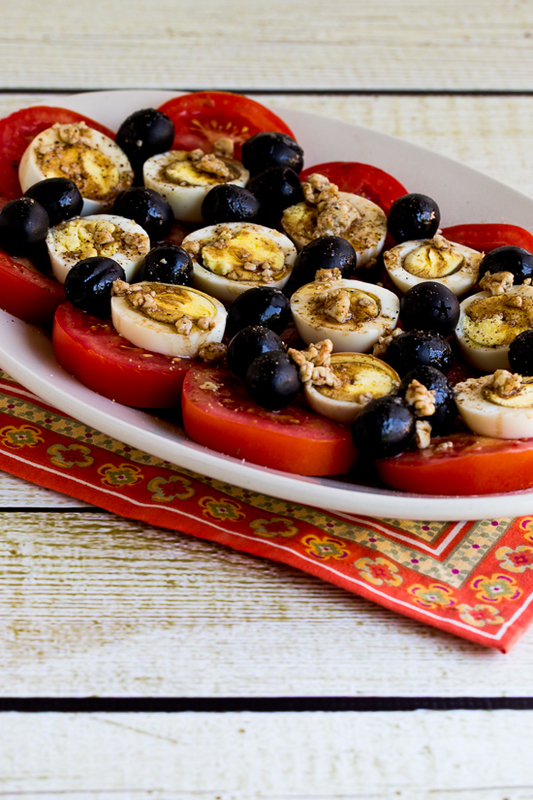 I am such a sucker for tomatoes and olives…and hard boiled eggs are just good. Thanks Joanne, so glad you like it! Perfect for the evenings when I just don't know what to eat and don't feel like cooking… These are ingredients I always have at home. Adina, so glad it will be useful for you. And I do know about those nights where you don't feel like cooking! Thanks everyone for the nice comments. I did love the taste of this, and with protein and veggies, it’s a perfect SB meal. Mae, thanks, but my photography and food styling are both in the beginning stages. I have a lot to learn to compete with your gorgeous photos. I noticed that “Still Life With” listed your blog as having great photography. Way to go, she is an expert. kaylyn good to see you are putting your gorgonzola supply to great use. WOW! The photos, Kalyn, are superb! I see you’ve got the hang of the camera. It won’t take you long to master it, i can see. Kalyn, looks wonderful to me even for breakfast (there’s eggs–works for me!) Really beautiful and I love the simplicity. Kalyn – this looks so good! oh yeah! gorgonzola vinaigrette – yum! Oh yumm! Keep those recipes with tomatoes coming! I need to use mine up. Kalyn, that looks fabulous, and so simple! I can’t wait to try it.